To me, the barn is the centerpiece of any farm. The tools, the hay/food, animal stalls, season specific items, and heavy equipment are all protected from the elements in the barn. In New England, barns are a classic barn red or white, having sliding access doors, and ventilation such as a cupola. Ours is red with black accents. 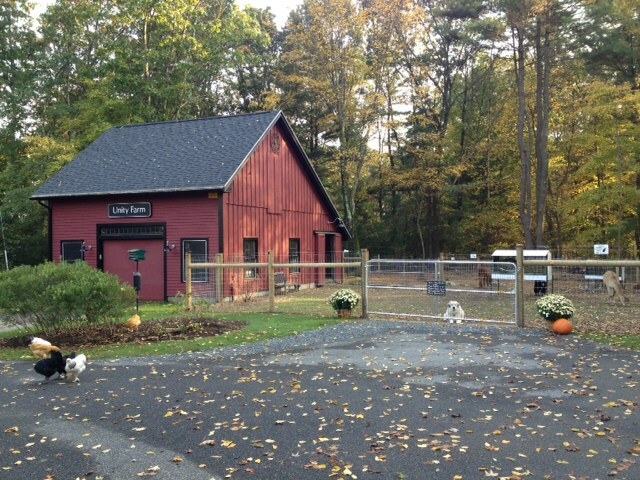 At Unity Farm, our barn is about 40x40 feet in size, has two post and beam stories, and three access doors. The front of the barn holds our grains and seeds in water proof metal cans held closed by spring loaded metal chains and hooks of my own design - call them unchewable bungie cords. Our tools are racked in a Rubbermaid tool caddy. The chainsaw and brush cutter are stacked against the east wall. Our red dragon flamethrower (for weeding), and our commercial sprayer are hung on hooks. A Craftsman workbench and pegboard provides storage for hammers, screw drivers and saws. We store our portable animal pens (great for veterinary visits, isolating animals during their introduction to the herd, and for containing animals when they need to be haltered) and llama/alpaca scale against the west wall. Our freeze proof water source - a yard hydrant - is also on the first floor inside a five foot deep french drain. Fly management is via hanging fly tapes strategically placed in areas that flies gather. Ventilation fans on the first floor keep the air moving. The animal stalls have heavy sliding wood doors that keep the animals separated from the tool and storage area. Sliding weatherproof doors give them easy access to the paddocks. Lighting inside the barn is all LED, consuming less than 100 watts for the entire structure. Lighting outside the barn includes 4 classic gooseneck barn lights with halogen bulbs on a photo sensor circuit that turns them on during night time hours. The stalls are outfitted with wall mounted buckets and hay feeders. Floors are lined with one inch thick rubber mats that are easy to clean. The second floor hayloft can store up to 10 tons of hay. Hay doors give us easy loading access using a hay elevator. A heat activated ventilator fan keeps the hay cool and dry. Kathy designed the Unity Farm signage that is mounted on rails attached to the clapboard. The barn is so functional that all our animal chores are simple. We can move animals in and out of stalls, retrieve hay, and fill water buckets seamlessly. We clean the stalls twice a day - once in the early morning and once in the early evening, managing manure in our compost area. Our Great Pyrenees Mountain dogs sleep with the alpacas and llamas, which is especially comforting for us when we hear a pack of coyotes calling from the apple orchard late at night. 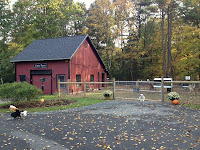 Thus far, the security of the barn with its nighttime lighting and livestock guardian animals has kept the citizens of Unity Farm healthy and happy. The scent of hay, sounds of humming camelids, and crunch of straw underfoot is so appealing, that I often sit in the barn with the animals at night before bed. If I'm ever asked about my manners, I can always claim that I feel at home in a barn! I've spent a few summers working on a farm. I love these notes. One of my observations is that the most difficult part of owning animals is that you become tied to the farm. Your desire to spend a couple weeks in southern France does not easily jibe with the daily chores. That, for me, is the biggest sacrifice farmers make for the rest of us. It's a 24/7 job, and it's more anxiety-provoking to have someone else take care of the farm when you are gone than to have them take care of the kids! Here's a fly management tip that we use in our horse barn... fill sealable sandwich bags half full of water and hang them over each entrance. We do this with one bag over each of our three 12' doors and the results have been amazing! I don't know why it works, but it does.